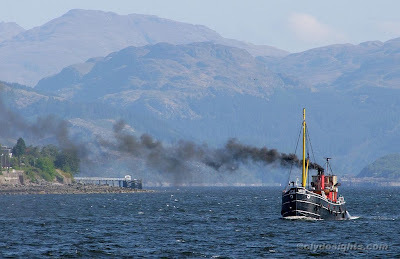 Back on the Clyde for a few days this spring, the preserved steam puffer VIC 32 spent Tuesday night in the sheltered waters of Loch Goil before heading down Loch Long and past the mouth of the Holy Loch, as seen in this view. The pier in the background is at Blairmore. VIC 32, built in 1943, last visited the Clyde last spring, and was seen then at Glasgow.